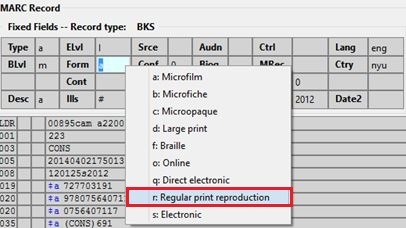 The MARC Fixed Field Editor provides suggested values for select fixed fields based on the record type being edited. Users can right-click on the value control for a fixed field and choose the appropriate value from the menu options. The Evergreen database contains information from the Library of Congress’s MARC 21 format standards that includes possible values for select fixed fields. The right-click context menu options are available for fixed fields whose values are already stored in the database. For the fixed fields that do not already contain possible values in the database, the user will see the basic clipboard operation options (such as cut, copy, paste, etc.). Within the bibliographic record that needs to be edited, select Actions for this Record. Make sure that the Flat-Text Editor checkbox is not selected and that you are not using the Flat-Text Editor interface. Right-click on the value control for the fixed field that needs to be edited. Select the appropriate value for the fixed field from the menu options. Continue editing the MARC record, as needed. Once you are finished editing the record, click Save Record. Changing the values in the fixed fields will also update the appropriate position in the Leader or 008 Field and other applicable fields (such as the 006 Field). MARC Editor users retain the option of leaving the fixed field value blank or entering special values (such as # or | ). It may be necessary for MARC Editor users to first correctly pad the fixed fields to their appropriate lengths before making further modifications to the fixed field values. config.marc21_ff_pos_map describes, for the given record type, where a fixed field is located, its start position, and its length. config.coded_value_map defines the set of valid values for many of the fixed fields and the translatable, human-friendly labels for them. config.record_attr_definition links together the information from the config.marc21_ff_pos_map and config.coded_value_map tables.